Equilibrium Crunchits Low Sugar Treats are naturally healthy bite-sized treats, providing a wonderful variety of flavours, texture and aromas that horses and ponies will love. Made with Strawberry, Beetroot, Parsnip, Carrot, Banana, Pea and Spinach, Crunchits are delicious snacks that can be fed daily as a tasty treat or reward. 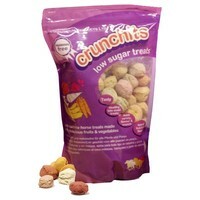 Crunchits Horse Treats are low in sugar so can be fed to all horses and ponies, including those prone to laminitis. They are manufactured under the BETA NOPS scheme.